The Jeep Easter Safari 2018 concepts have been unveiled and they look awesome. The first of the customs is the J-Wagon meant to be at home on the trials and in the city. The modified Wrangler Sahara has custom color and accessories along with lots of custom work on the interior, and rides on big 35″ KM3 BF Goodrich tires. 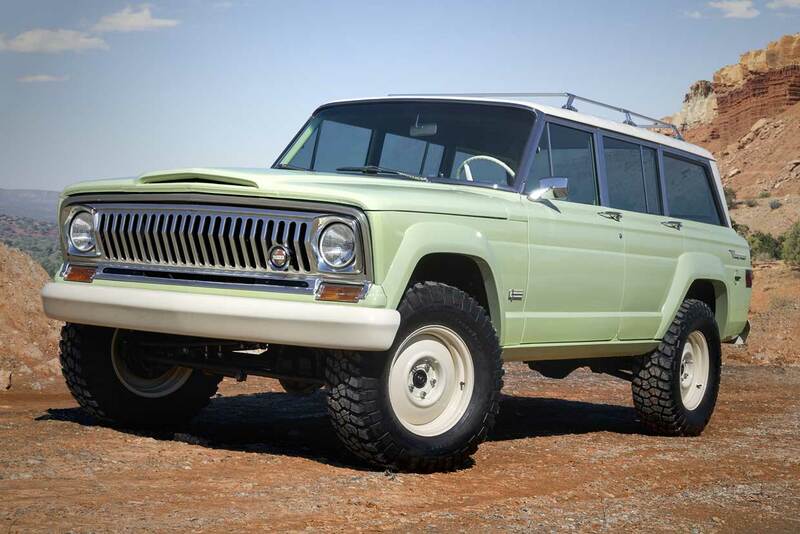 One of the coolest of those concepts is a heavily customized Jeep 4Speed. The lightweight jeep 22-inches chopped off but rides on on a stock Wrangler wheelbase. It has lots of carbon fiber components, including a carbon fiber and aluminum rear tub, and is driven along by a 2.0-liter turbo engine. 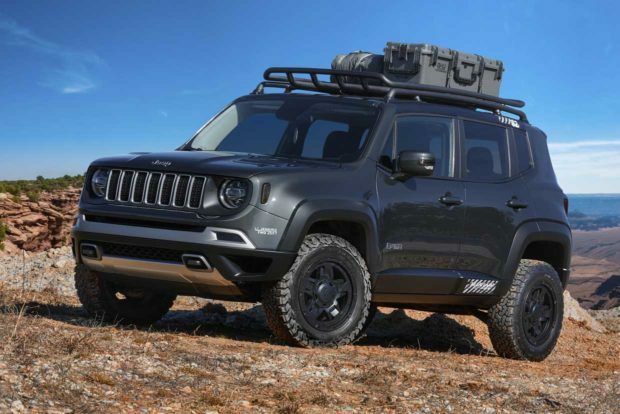 The B-Ute uses a 2.4L Tigershark engine, 9-speed auto, and lots of parts form Jeep Performance Parts for off-road adventuring. Another on of my favorites is the old-school looking Wagoneer Roadtrip. It has a wheelbase stretched by 5-inches but uses the original steel body. It has lots of custom touches including a 5.7L V8 and 4-speed automatic. The Nacho Jeep is a “rolling catalog” of Mopar Jeep Performance Parts, done up in a color reminiscent of nacho cheese. 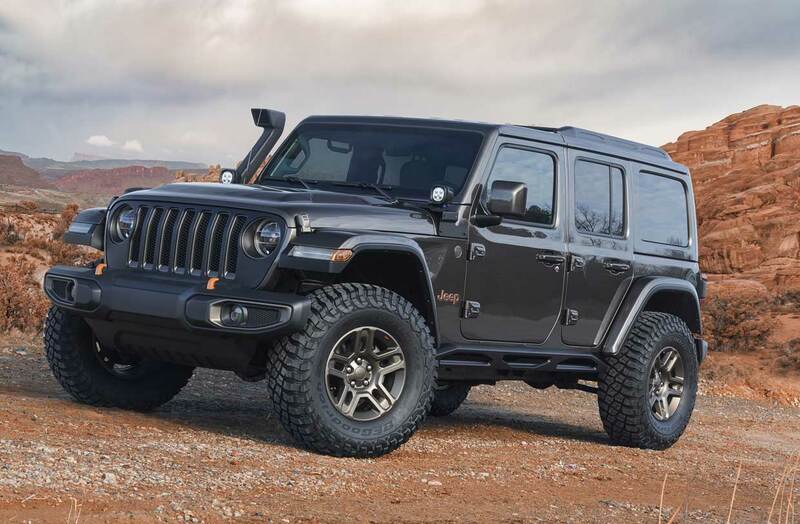 It started off as a Wrangler JL Rubicon, but has been lifted by 2 inches, rides on 2.5″ diameter aluminum shocks, and is loaded up with LED lighting for off-road fun in the dark. 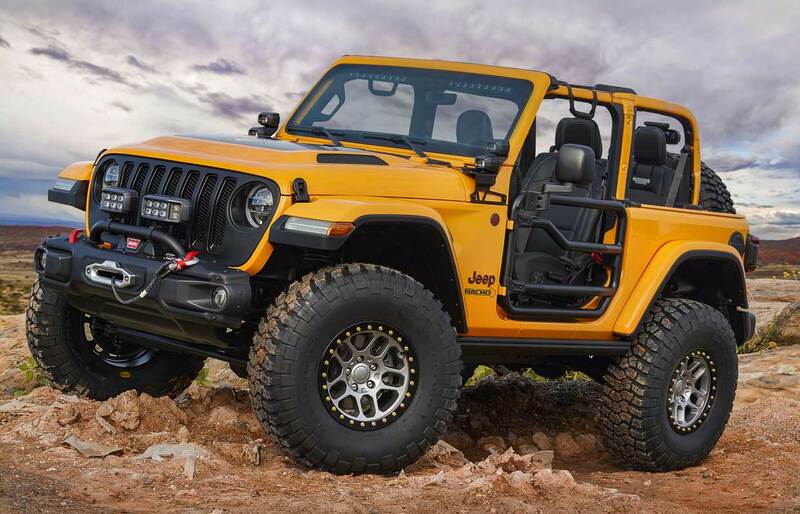 The Jeep Sandstorm was inspired by Baja racers, and has a massive 18″ wheel articulation. 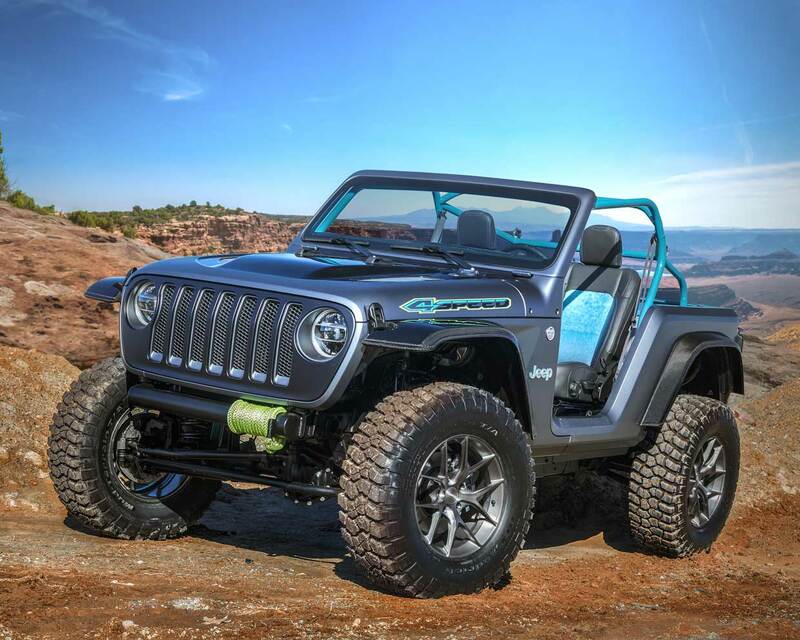 Jeep says that this vehicle is about off-road capability and the ability to tear up the sand. 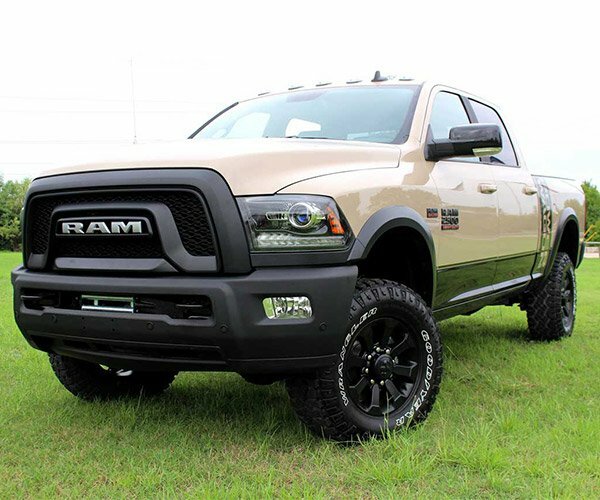 It packs a 6.4L V8 from the Mopar performance catalog along with a 6-speed manual transmission, and rides on 17″ beadlock wheels wrapped in 39.5″ BF Goodrich Krawler tires. 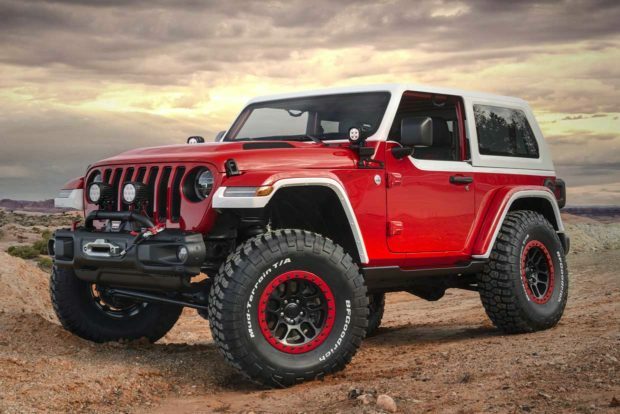 The Jeepster is based on a Wrangler Rubicon and features red and white styling meant to remind of the 1966 Jeepster. 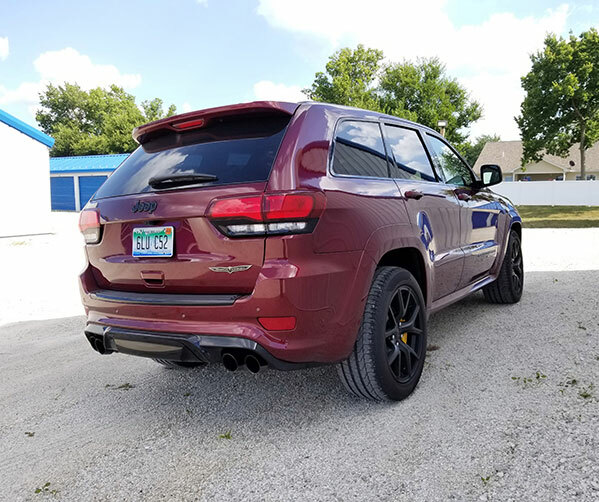 It’s been shortened by 2 inches, lifted by the same amount, and seen its window lowered and raked to give it a sporty look.